50. James Thomas5 Mcginnis (John Kopel4, Jesse3, John2, Thomas1) was born March 11, 1855, and died Abt. 1940. He married Lillian Smith September 11, 1884. She was born Abt. 1865. + 68 i. Hugh Thomas6 Mcginnis, born October 29, 1886 in baker Kansas; died March 29, 1964. 69 ii. Alva Guy Mcginnis, born March 03, 1891. + 70 iii. Bessie Eldred Mcginnis, born June 24, 1885. + 71 iv. Mary Evenly Mcginnis, born June 13, 1894. + 72 v. Coral Jessie Mcginnis, born June 08, 1889 in Norton county Norton Kansas; died April 27, 1914. 51. William Henry5 Mcginnis (John Kopel4, Jesse3, John2, Thomas1) was born September 20, 1858, and died December 01, 1938. He married Lottie May Simpson August 07, 1887. She was born August 08, 1870, and died January 21, 1917. + 73 i. Carrie6 Mcginnis, born June 26, 1888. + 74 ii. Cora Mcginnis, born March 30, 1890. + 75 iii. Edith Mcginnis, born March 13, 1892. 76 iv. Gladys Mcginnis, born October 15, 1899. She married Arnold Zuck. 52. Robert Jousha5 Mcginnis (John Kopel4, Jesse3, John2, Thomas1) was born August 20, 1849, and died March 28, 1906. He married Nellie Mcgrain August 24, 1872. She was born July 1849, and died October 1931. 77 i. Winnie6 Mcginnis, born September 03, 1873. 78 ii. Percy Karl Mcginnis, born March 21, 1875. + 79 iii. Ethel Davis Mcginnis, born October 08, 1876; died November 1953. + 80 iv. Lloyd Wilton Mcginnis, born February 28, 1878; died March 11, 1930. 53. John Allen5 Mcginnis (John Kopel4, Jesse3, John2, Thomas1) was born February 16, 1853, and died January 15, 1912. He married (1) Minnie Mccloud. She was born April 29, 1854, and died February 12, 1889. He married (2) Hannah Robinson. + 81 i. Charles Roy6 Mcginnis, born March 18, 1879. 82 ii. Everett Mcginnis, born May 09, 1882; died March 20, 1920. He married Blanch Pearl Sevier August 05, 1903; born March 13, 1885. + 83 iii. Mabel Edith Mcginnis, born March 28, 1885; died November 07, 1910. 54. Jesse Franklan5 Mcginnis (John Kopel4, Jesse3, John2, Thomas1) was born June 22, 1851, and died January 20, 1941. He married Delia Erp December 25, 1896. She was born June 22, 1869, and died March 13, 1944. 84 i. Ralph E6 Mcginnis, born November 04, 1900. He married Blanche E Hood November 26, 1924; born October 10, 1899. + 85 ii. Alta Mcginnis, born February 18, 1904. 56. Mary Ella5 Mcginnis (John Kopel4, Jesse3, John2, Thomas1) was born April 05, 1868, and died January 26, 1950. She married Henry Schaible August 12, 1891. He was born August 23, 1867, and died January 27, 1950. + 86 i. Frank J6 Schaible, born March 26, 1893. + 87 ii. Ethel Fern Schaible, born October 30, 1894. + 88 iii. Harold M Schaible, born March 03, 1897. + 89 iv. Kent H Schaible, born February 25, 1908. 63. Elizabeth5 Livesay (Alla4 Mcginnis, Moses3, Edward2, Thomas1) was born November 24, 1853 in Clinch Valley, Hancock TN, and died August 04, 1932. She married William Luther Stapleton April 19, 1869. He was born August 15, 1856, and died May 11, 1886. 90 i. Livonia Florance6 Stapleton, born July 05, 1875; died May 17, 1912. 91 ii. Robert Grant Stapleton, born September 17, 1879; died June 05, 1928. 92 iii. Nancy Jane Stapleton, born April 23, 1881; died November 02, 1945. 93 iv. Mary Lavonia Stapleton, born November 12, 1884; died November 13, 1929. 94 v. William Harrison Stapleton, born May 07, 1886. 65. George5 Livesay (Alla4 Mcginnis, Moses3, Edward2, Thomas1) was born September 24, 1856, and died June 12, 1928. He married Elizabeth Slaton Johns December 14, 1881, daughter of Rail Johns and Alice Slaton. She was born April 19, 1863, and died February 14, 1957 in Knoxville Tennessee. 95 i. Mattie Alice6 Livesay, born February 18, 1885; died January 09, 1966. 96 ii. Ben H Livesay, born February 08, 1888; died May 11, 1952. 97 iii. Henry Tyler Livesay, born September 14, 1891; died September 18, 1892. 98 iv. John Freeman Livesay, born May 14, 1893; died November 30, 1945. 99 v. Bobbie Mabel Livesay, born September 18, 1895; died August 25, 1987. 100 vi. Edith Magnolia Livesay, born November 23, 1903; died October 23, 1986. 66. John5 Livesay (Alla4 Mcginnis, Moses3, Edward2, Thomas1) was born March 17, 1861, and died August 19, 1932. He married (1) Lydia Henry 1881. She was born Abt. 1861 in Brays, Hancock co, TN.. He married (2) Mollie Buttry December 16, 1903. She was born Abt. 1870. 101 i. Everett J6 Livesay, born August 28, 1889; died October 05, 1889. 102 ii. Alfred Taylor Livesay, born August 07, 1890. 103 iii. Prior Tipton Livesay, born May 15, 1892. 104 iv. William M Livesay, born February 15, 1894; died July 29, 1953. 105 v. Elisha Eli Livesay, born December 06, 1895; died January 29, 1920. 106 i. Archie Marie6 Livesay, born September 26, 1904. 107 ii. Theodore R Livesay, born February 14, 1906; died March 01, 1906. 108 iii. Minnie Ester Livesay, born February 26, 1910; died November 21, 1967. 109 iv. Anna Lee Livesay, born June 21, 1913. 68. Hugh Thomas6 Mcginnis (James Thomas5, John Kopel4, Jesse3, John2, Thomas1) was born October 29, 1886 in baker Kansas, and died March 29, 1964. He married Christina May Michaels June 10, 1930 in Norton Kansas,(Norton county), daughter of Isaiah Michals and Sarah Thompson. She was born March 26, 1905, and died September 01, 1979 in Salina Kansas. + 111 ii. Cleta Jean Mcginnis, born June 09, . 70. Bessie Eldred6 Mcginnis (James Thomas5, John Kopel4, Jesse3, John2, Thomas1) was born June 24, 1885. She married William Kidder August 30, 1905. He was born January 24, 1875, and died November 20, 1957. + 112 i. Mildred Margaret7 Kidder, born August 16, 1906. + 113 ii. Alpha Anna Kidder, born April 01, 1909. + 114 iii. Ethel Evelyn Kidder, born July 26, 1911. + 115 iv. Leora Ieleen Kidder, born December 19, 1913; died April 09, 1940. 116 v. Edwin Guy Kidder, born September 23, 1917. He married Muriel Filbrant January 20, 1945; born October 23, 1912 in Canada. 71. Mary Evelyn6 Mcginnis (James Thomas5, John Kopel4, Jesse3, John2, Thomas1) was born June 13, 1894. She married Hugh E O Drain June 16, 1927. He was born July 28, 1893 in Denver co, and died July 15, 1964. 117 i. James Hugh O Drain, born July 16, 1928. He married Yvonna Corsena July 05, 1959 in Richmond California; born November 25, 1936. 72. Coral Jessie6 Mcginnis (James Thomas5, John Kopel4, Jesse3, John2, Thomas1) was born June 08, 1889 in Norton county Norton Kansas, and died April 27, 1914. She married Edward Francis Cox April 17, 1909. He was born February 04, 1886, and died September 10, 1955. 118 i. Noel Francis7 Cox, born October 21, 1909; died May 07, 1968. He married Madeline Hadley July 05, 1950. 119 ii. Lillian Eleanor Cox, born March 15, 1911. 73. Carrie6 Mcginnis (William Henry5, John Kopel4, Jesse3, John2, Thomas1) was born June 26, 1888. She married Keever Wharton. 120 i. Lillian Ruth7 Wharton, born December 12, 1914. She married Byrle B Womble May 14; born November 24, 1913; died May 24, 1952. + 121 ii. William Edwin Wharton, born February 13, 1917. 74. Cora6 Mcginnis (William Henry5, John Kopel4, Jesse3, John2, Thomas1) was born March 30, 1890. She married Clyde Stratton. + 122 i. Wm Arthur7 Stratton. + 123 ii. Dorothea Mae Stratton. 75. Edith6 Mcginnis (William Henry5, John Kopel4, Jesse3, John2, Thomas1) was born March 13, 1892. She married (1) Vern. She married (2) Homer Craig. 124 i. Donald Homer7 Craig. 79. Ethel Davis6 Mcginnis (Robert Jousha5, John Kopel4, Jesse3, John2, Thomas1) was born October 08, 1876, and died November 1953. She married Melville W Street. He was born May 21, 1861, and died August 29, 1943. + 125 i. Glen Melville7 Street, born June 19, 1897. 80. Lloyd Wilton6 Mcginnis (Robert Jousha5, John Kopel4, Jesse3, John2, Thomas1) was born February 28, 1878, and died March 11, 1930. He married Florence Smith. + 126 i. Lloyd Wilton Jr7 Mcginnis, born March 24, 1906. 81. Charles Roy6 Mcginnis (John Allen5, John Kopel4, Jesse3, John2, Thomas1) was born March 18, 1879. He married (1) Bertha Belle Sevier January 30, 1901. She was born April 25, 1883, and died March 12, 1953. He married (2) Frances E Pinckney October 20, 1917. She was born March 10, 1898, and died March 10, 1949. + 127 i. Beulah Mabel7 Mcginnis, born November 17, 1901. 128 ii. Frieda Belle Mcginnis, born May 06, 1907; died January 22, 1913. + 129 iii. Charles Lee Mcginnis, born January 30, 1915. + 130 i. Velma Irene7 Mcginnis, born March 08, . + 131 ii. Dorothy Grace Mcginnis, born April 15, . + 132 iii. Ruby Eileen Mcginnis, born January 08, . 83. Mabel Edith6 Mcginnis (John Allen5, John Kopel4, Jesse3, John2, Thomas1) was born March 28, 1885, and died November 07, 1910. She married Keever Wharton. + 133 i. Mabel7 Wharton, born November 01, . 85. Alta6 Mcginnis (Jesse Franklan5, John Kopel4, Jesse3, John2, Thomas1) was born February 18, 1904. She married Philip G Fernkopf May 25, 1927. He was born May 12, 1900. 134 i. Marvin Wayne7 Fernkopf, born April 23, . He married Barbara Lou Baker October 07, 1950; born August 10, 1929. 135 ii. Allen Richard Fernkopf, born August 17, . 86. Frank J6 Schaible (Mary Ella5 Mcginnis, John Kopel4, Jesse3, John2, Thomas1) was born March 26, 1893. He married Bertha Laugham January 06, 1915. + 136 i. Billie Frank7 Schaible, born May 06, . 87. Ethel Ferne6 Schaible (Mary Ella5 Mcginnis, John Kopel4, Jesse3, John2, Thomas1) was born October 30, 1894. She married Joseph L Yager August 04, 1927. + 137 i. Josph L7 Yager, born June 16, . 88. Harold M6 Schaible (Mary Ella5 Mcginnis, John Kopel4, Jesse3, John2, Thomas1) was born March 03, 1897. He married Helen Mccauley July 30, 1930. 138 i. Robert Hilton7 Schaible, born April 30, . 89. Kent H6 Schaible (Mary Ella5 Mcginnis, John Kopel4, Jesse3, John2, Thomas1) was born February 25, 1908. He married Viola Trentman August 17, 1929. 139 i. Barbara Jean7 Schaible, born December 11, . 140 ii. Judith Fern Schaible, born August 25, . 110. William Thomas7 Mcginnis (Hugh Thomas6, James Thomas5, John Kopel4, Jesse3, John2, Thomas1) was born July 21, in Norton county Norton Kansas. He married (1) Sally Darnell Wright February 14, 1962, daughter of Elisha Wright and Della Cummings. She was born December 28, 1945 in Ogden Kansas, and died April 12, 1999 in Seneca Kansas, at her daughters home under the care of her eldest JoAnn. He married (2) Martha Akins June 30, 2001 in Seneca Kansas. She was born September 16. + 141 i. Della JoAnn8 Mcginnis, born November 19, in Manhattan Kansas. + 142 ii. Fay France Ann Mcginnis, born December 24, in fort raily Kansas, Ervining army hospital. + 143 iii. Rebecca Ann Mcginnis, born May 24, . 144 iv. Jimmy Dean Mcginnis, born July 03, . + 145 v. Christina Ann Mcginnis, born June 13, . + 146 vi. Patricia Ann Mcginnis, born May 26, . + 147 vii. Tammy Ann Mcginnis, born October 31, . 111. Cleta Jean7 Mcginnis (Hugh Thomas6, James Thomas5, John Kopel4, Jesse3, John2, Thomas1) was born June 09, . She married Cleve Mulder January 15, 1950. 148 i. Larry Jean8 Mulder, born February 04, . + 149 ii. Loren Hugh Mulder, born April 15, . 112. Mildred Margaret7 Kidder (Bessie Eldred6 Mcginnis, James Thomas5, John Kopel4, Jesse3, John2, Thomas1) was born August 16, 1906. She married (1) Alvin Pettijohn September 15, 1925, son of James Pettijohn and Anderson. He was born November 23, 1898, and died November 23, 1928. She married (2) Roy Robert Sneller August 15, 1929 in tribune Kansas, son of Martian Sneller and Dora Arnold. He was born May 11, 1893. + 150 i. Rhonda Lorraine8 Pettijohn, born July 23, in Norton county Norton Kansas. + 151 ii. Paul Alvin Pettijohn, born February 29, in Eads colo.
+ 152 i. Robert James8 Sneller, born March 12, in Wiley colo.
+ 153 ii. Louise Mae Sneller, born January 19, . 113. Alpha Anna7 Kidder (Bessie Eldred6 Mcginnis, James Thomas5, John Kopel4, Jesse3, John2, Thomas1) was born April 01, 1909. She married Vernon C Miles August 21, 1927, son of Elmer Miles and Anna Roda. He was born August 28, 1907. + 154 i. Leland George8 Miles, born February 01, in rocky ford colo.
+ 155 ii. Faye Miles, born May 04, . 114. Ethel Evelyn7 Kidder (Bessie Eldred6 Mcginnis, James Thomas5, John Kopel4, Jesse3, John2, Thomas1) was born July 26, 1911. She married Harold W Davies September 09, 1929 in Norton Kansas,(Norton county). + 156 i. Harold William Jr8 Davies, born August 02, . + 157 ii. Warren Kay Davies, born October 26, in Kansas City area. 115. Leora Ieleen7 Kidder (Bessie Eldred6 Mcginnis, James Thomas5, John Kopel4, Jesse3, John2, Thomas1) was born December 19, 1913, and died April 09, 1940. She married Ted Gorrup October 07, 1935. 158 i. Carey8 Gorrup, born March 31,. 159 i. Lee Ann8 Wharton, born May 01, . 122. Wm Arthur7 Stratton (Cora6 Mcginnis, William Henry5, John Kopel4, Jesse3, John2, Thomas1) He married Mildred Gunn. 123. Dorothea Mae7 Stratton (Cora6 Mcginnis, William Henry5, John Kopel4, Jesse3, John2, Thomas1) She married Andrew Sticker. 125. Glen Melville7 Street (Ethel Davis6 Mcginnis, Robert Jousha5, John Kopel4, Jesse3, John2, Thomas1) was born June 19, 1897. He married (1) ?. He married (2) Hazel Marie. She was born June 19, 1908. + 169 i. Fredrick Lee8 Street, born January 28, . 126. Lloyd Wilton Jr7 Mcginnis (Lloyd Wilton6, Robert Jousha5, John Kopel4, Jesse3, John2, Thomas1) was born March 24, 1906. He married Maureen Vivian Woods 1930. She was born June 17, 1903. 127. Beulah Mabel7 Mcginnis (Charles Roy6, John Allen5, John Kopel4, Jesse3, John2, Thomas1) was born November 17, 1901. She married Thomas S Thomsen January 30, 1917. 171 i. Donald Chris8 Thomsen, born January 06, . 129. Charles Lee7 Mcginnis (Charles Roy6, John Allen5, John Kopel4, Jesse3, John2, Thomas1) was born January 30, 1915. He married Rose Shipp March 21, 1936. 130. Velma Irene7 Mcginnis (Charles Roy6, John Allen5, John Kopel4, Jesse3, John2, Thomas1) was born March 08, 1920. She married James Hershel Floyd March 10, 1937. 131. Dorothy Grace7 Mcginnis (Charles Roy6, John Allen5, John Kopel4, Jesse3, John2, Thomas1) was born April 15, She married Sierifine Larangiera June 18, 1938. 132. Ruby Eileen7 Mcginnis (Charles Roy6, John Allen5, John Kopel4, Jesse3, John2, Thomas1) was born January 08, 1926. She married George Edward Thomas March 20, 1951. 133. 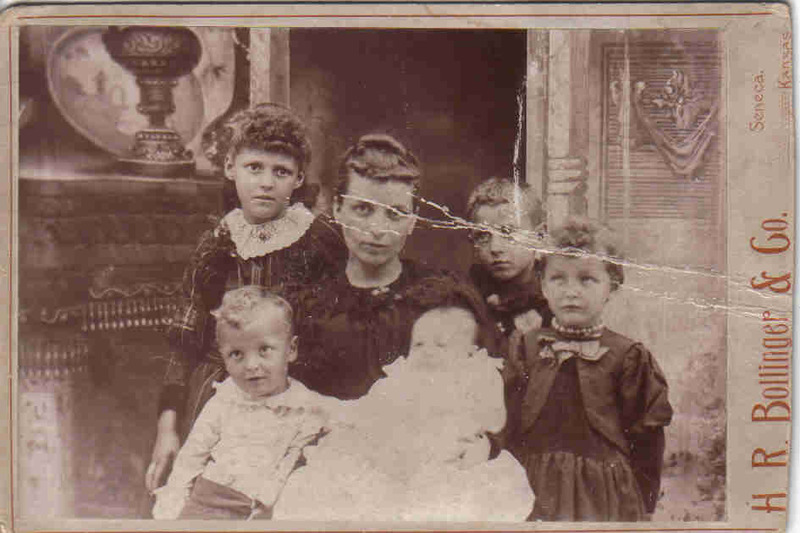 Mabel7 Wharton (Mabel Edith6 Mcginnis, John Allen5, John Kopel4, Jesse3, John2, Thomas1) was born November 01, 1910. She married Clarence Rinard October 06, 1934. 141. Della JoAnn8 Mcginnis (William Thomas7, Hugh Thomas6, James Thomas5, John Kopel4, Jesse3, John2, Thomas1) was born November 19, in Manhattan Kansas. She married (3) John Levi Johnson. She met (2) Jay Evert Ward 1978 in Elmdale Kansas, son of James Ward and Dorothy. He was born Abt. 1959. She married (1) Vernon Charles McAuliffe. February 14, 1981 in Seneca Kansas, son of Damion Mcauliffe and Vera Shockey. He was born September 21, in Axtell Kansas. + 193 i. William Elisha9 Mcginnis, born December 09, in Salina Kansas (Ausbery Hospital). 143. Rebecca Ann8 Mcginnis (William Thomas7, Hugh Thomas6, James Thomas5, John Kopel4, Jesse3, John2, Thomas1) was born May 24, She married Stanley Tabor. 197 i. Douglas Wade9 Tabor. 198 ii. Jessica Leigh Tabor. 145. Christina Ann8 Mcginnis (William Thomas7, Hugh Thomas6, James Thomas5, John Kopel4, Jesse3, John2, Thomas1) was born June 13, She married Richard Conner. 199 i. Dillon Tyler9 Conner. 200 ii. Katelyon Darnell Conner. 146. Patricia Ann8 Mcginnis (William Thomas7, Hugh Thomas6, James Thomas5, John Kopel4, Jesse3, John2, Thomas1) was born May 26, She married Bradley Stone. 201 i. Joshua Allen Mcginnis9 Stone. 202 ii. Distain James Stone. 203 i. Austin James9 Lambert. 204 ii. Cerio Elaine Lambert. 205 iii. Shawn Thomas Lambert. 209 ii. Joyce Elaine Fowler, born July 02, She married Roger Lee Arches December 01, 1967. 151. Paul Alvin8 Pettijohn (Mildred Margaret7 Kidder, Bessie Eldred6 Mcginnis, James Thomas5, John Kopel4, Jesse3, John2, Thomas1) was born February 29 in Eads colo. He married Mary Kathleen Moran May 19, 1951 in Pittsburgh pa, daughter of Geo Moran and Margaret Zerbe. 152. Robert James8 Sneller (Mildred Margaret7 Kidder, Bessie Eldred6 Mcginnis, James Thomas5, John Kopel4, Jesse3, John2, Thomas1) was born March 12, in wiley colo. He married Patricia Ann Young September 11, 1956 in Salina, daughter of Sidney Young and Golda Brown. 217 i. Theresa Ann9 Sneller, born August 29, in Salina Kansas. 218 ii. Robert James Jr Sneller, born April 14, in Salina Kansas. 153. Louise Mae8 Sneller (Mildred Margaret7 Kidder, Bessie Eldred6 Mcginnis, James Thomas5, John Kopel4, Jesse3, John2, Thomas1) was born January 19, . She married (1) Robert G Cochran in San Rafael California, son of Irl Cochran and Alma. He was born January 30, She married (2) Stan Jose October 09, 1966 in York NE, son of Oren Jose and Irene Marcia. He was born in Lamar colo.
219 i. Joan Elaine9 Cochran, born July 19, She married Jesse Hernandez. 154. Leland George8 Miles (Alpha Anna7 Kidder, Bessie Eldred6 Mcginnis, James Thomas5, John Kopel4, Jesse3, John2, Thomas1) was born February 01, in rocky ford colo. He married Peggy Joyce O Neal February 04, 1950 in Olney springs colo, daughter of Patrick Neal and Annie Bagwell. 221 i. Joyce Ann9 Miles, born February 03, in dequeen ark,. 222 ii. Larry Wayne Miles, born July 29, in Oceanside California. 223 iii. Barbara Lee Miles, born April 16, in Lamar colo.
224 iv. Roger Lee Miles, born April 25, in Montrose colo.
225 v. Robert Leland Miles, born August 19, in Montrose colo.
155. Faye8 Miles (Alpha Anna7 Kidder, Bessie Eldred6 Mcginnis, James Thomas5, John Kopel4, Jesse3, John2, Thomas1) was born May 04, . She married (1) Jack Henry. She married (2) George Prager April 14, 1950. He was born in of Maryland. She married (3) Carl Reuth May 24, 1959. He was born in of Denver. 156. Harold William Jr8 Davies (Ethel Evelyn7 Kidder, Bessie Eldred6 Mcginnis, James Thomas5, John Kopel4, Jesse3, John2, Thomas1) was born August 02, He married Norma Jean Pohl May 27, 1956 in emporia ks, daughter of Gusdoff Pohl and Verna Haake. She was born September 25, in emporia ks. 229 i. Diana Kalinda9 Davies, born April 30, in East Lansing, Mich.
230 ii. Larine Callista Davies, born April 27, in fort Wayne ind..
231 iii. Wade Murdock Davies, born May 06, . 169. Fredrick Lee8 Street (Glen Melville7, Ethel Davis6 Mcginnis, Robert Jousha5, John Kopel4, Jesse3, John2, Thomas1) was born January 28, 1 He married Barbara Ann Ertassi May 21, 1950. 207. Jennifer Lynn9 Mulder (Loren Hugh8, Cleta Jean7 Mcginnis, Hugh Thomas6, James Thomas5, John Kopel4, Jesse3, John2, Thomas1) was born June 06, She met Kevin Clay Dean. He was born February 11, in South Korea, CHUNG-CHONG CITY..
237 i. Damion Mikal10 Dean, born July 09, in Salina Regional Health Center Santa Fe Campus.